I have always loved having long hair. I went through periods in my life when I would cut my hair short but I would almost always revert back to the long styles. When my hubby met me, my hair was shoulder length, but as I got to know him better I found out that he loved long hair. So, when we were married, I decided that I wouldn't cut my hair again except for a trim to keep it healthy. The longest my hair has been is waist length and oh goodness...it was SO heavy then! I ended up getting about 6 inches taken off simply because my hair was falling out (hormone dump after giving birth) and getting it cut was the only way to get it to stop falling out. One of the hardest things to do is to find the time to do my hair. Not only is my hair long, it is THICK and has a slight wave to it. So, I typically put it up in a bun/French twist thing and that is that. I don't style it much and it is held in place with two jaw type clips. 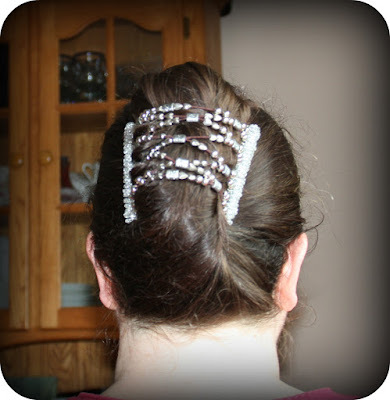 Using barrettes is usually out of the question because they don't hold my hair and pop open. That is why I use the jaw clips. Well, as usual, those get boring so I am always looking for other options. 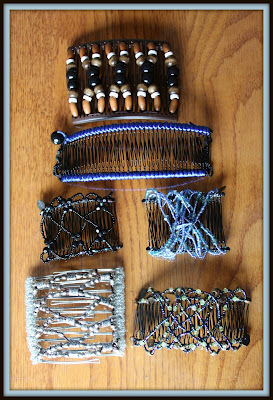 HairZings are 100% hand beaded by women artisans working in small businesses, collectives, workshops, or home environments. We offer dignified work, flexible schedules, and the ability to earn fair wages. African Collection is produced by the Maasai women in Kenya. They enthusiastically launched their collective "Olorien" (meaning "olive tree") and are proud to sustain themselves using their legendary beading skills. ASIA: HairZing is also made in rural China. Due to lack of jobs, women are forced to leave their children behind for factory labor in larger cities. Because of the distance, they are often separated from their children for most of the year. As an alternative, we established a worker-centered company where the women are able to stay with their families, earn fair wages, and control when and where they work. Ultimately, our goal is that every woman involved with HairZing - from craftswomen to customers - is bettered in some way because of our products. We take great care to use as many renewable and recyclable materials as possible. For example, this often means substituting bamboo beads (a renewable resource) for wooden beads, or glass for plastic whenever possible. Living in an imperfect world, we cannot always find as environmentally friendly materials as we would like… but we keep looking. We are dedicated to offering superior quality, gorgeous products without sacrificing the planet we share. I always love promoting companies on my blog that try to help out women in other countries. It seems like such a small thing but really, it makes such a huge difference. So, for this review I was sent some products from HairZing and I am SO excited to share my experience with you all today! 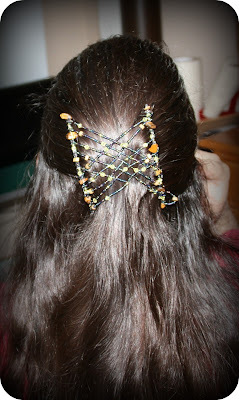 These look so much like jewelry for your hair, I cannot get over how gorgeous all the bead work is. What I loved about HairZing when I visited their website is that you can choose HairZings based on what type of hair you have. 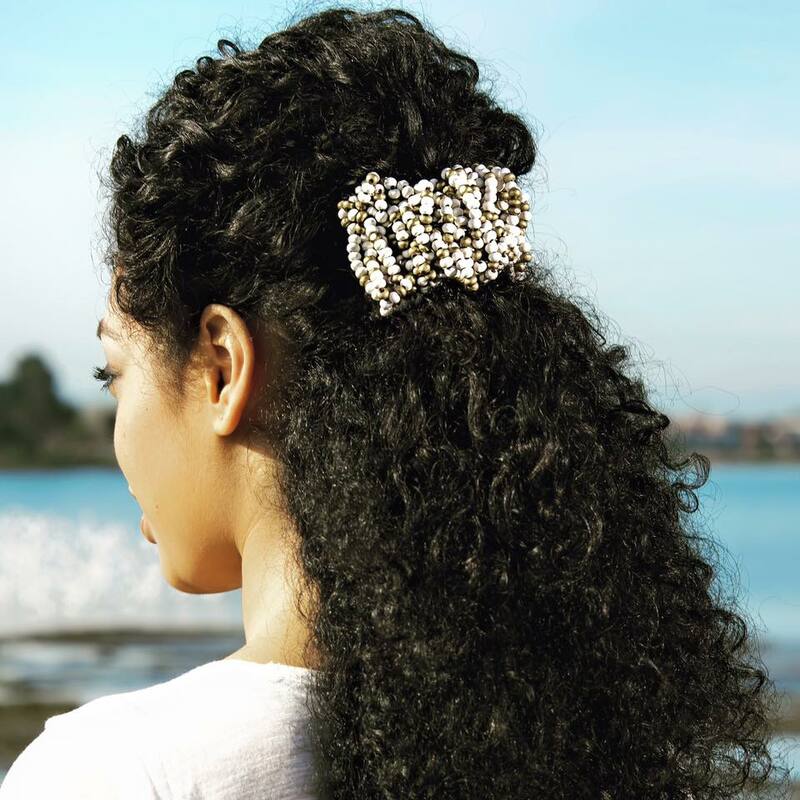 They carry clips for thick, wavy, thin, fine, sleek, straight, coily, curly hair and just about any other type of hair out there. Because my hair is so thick, I needed clips to accommodate that. So, without further ado, let me show you my amazing updos with HairZing! This is my second-favorite way to style my hair. Half up, half down. What I loved was that when I put HairZing in my hair, I had very few fly-aways. Every hair was held in place and it literally took me seconds to get my hair in the combs. And THIS is my absolute favorite way to style my hair. I love French Twists and this is my version of that. My hair is twisted up and then the ends are looped around and tucked in. I found that the Wide Eyelet HairZing held my hair up in this style the best. When your hair is as long and thick as mine, you need something to keep it all contained and I love how HairZing does that. My daughter has long hair just like me and she has some serious fly-aways as well. 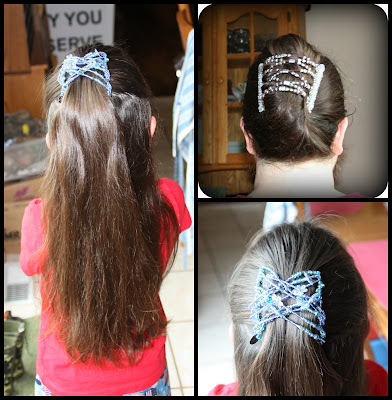 She loved wearing the Original Wire hair combs (probably mostly because they are really sparkly and colorful). They held her hair perfectly even when she was running around outside playing and being crazy. I love how secure it holds every style in place. So, what can HairZing do for YOU? Save time. Your hair could take 24/7 – grab your HairZing instead because you have better things to do. HairZing won’t snag, pull or tangle: The teeth are designed to slide easily into and out of thick hair. Flattering hairstyles: Messy or sleek buns, ponytails, Up-dos. 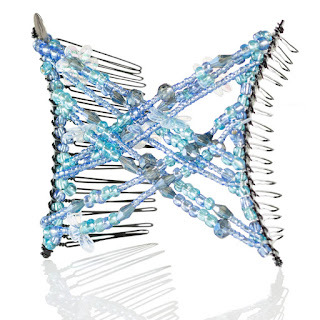 Get the ‘do without sacrificing a whole pack of bobby pins! Your hair wont dent when it's wet and won't frizz when it's dry. Shop risk free: 90 Day Happiness Guarantee - if you don't love your HairZing, we'll take it back. If all of those things sound good to you, then it is time for you to try out HairZing for yourself! They have so many different comb choices, you can tailor your choices to your hair type. This is wonderful and why I love HairZing. As a special bonus for my readers, you can get 10% off by entering the code SALLY10Z! This offer expires two weeks from today so hurry and get your order placed soon!! 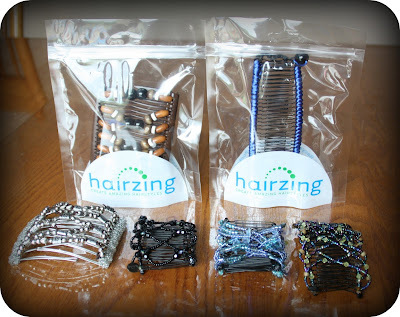 I would love to recommend HairZing to all of my readers today! Their products are amazing and I love how the combs hold my long, thick hair perfectly. Please visit HairZing today and also, make sure you follow them on their social media platforms...Instagram, Twitter, Facebook and YouTube (on which you can watch some tutorials on how to create even more hairstyles with HairZing! ).